Diplodia ear rot (Photo 1) is possibly the most damaging and important ear rot disease in southern Africa caused by the fungi Stenocarpella maydis and Stenocarpella macrospora. Stenocarpella macrospora ear rot symptoms are almost identical to those of Diplodia ear rot, but occur under different climatic and epidemiological conditions. 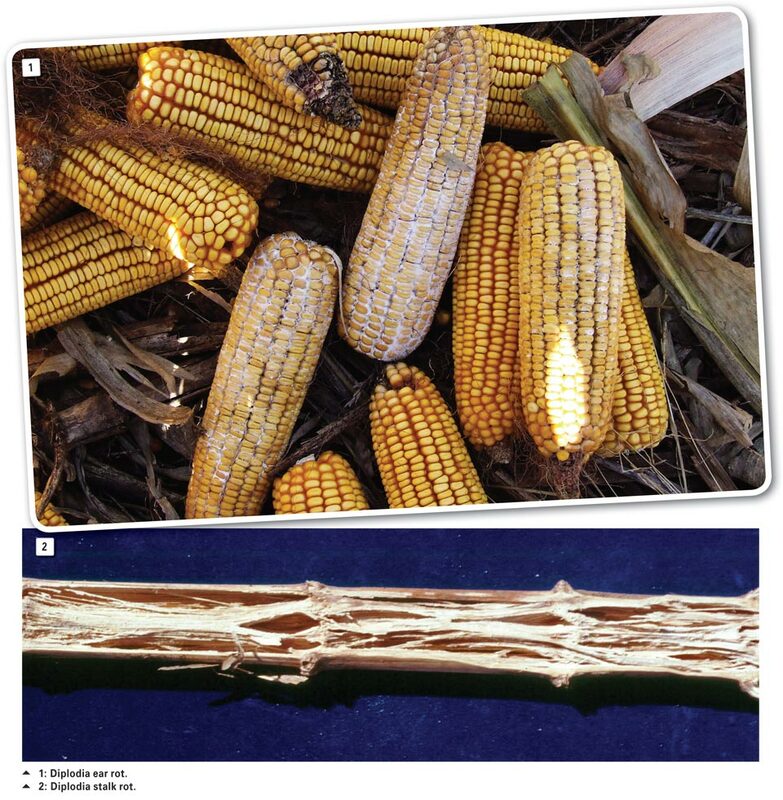 Macrospora ear rot appears to be predominant in areas of KwaZulu-Natal where Diplodia ear rot can occur throughout the entire maize production area of South Africa. Diplodia ear rot control measures are not always directly applicable to Macrospora ear rot and must be treated as two distinct separate diseases which vary greatly in terms of their epidemiology. Macro spora ear rot can easily be confused with Diplodia ear rot, not only by producers, but by agricultural advisors and agronomists as well. This confusion stems from the inability to determine the correct identity of the specific disease in a specific area often resulting in conflicting research results and advice. If a producer is not certain which ear rot organism is present, they must please contact their local plant pathologist. These two pathogens, although visually identical in the field, can only be distinguished based on isolation onto artificial media and then identified based on spore size and shape. Diplodia ear rot results in yield loss (when light weight rotten kernels are discarded in the harvesting process), grain grade reductions and toxicity problems for both humans and animals. Diplodia stalk rot (Photo 2) is caused by the same pathogen, namely, Stenocarpella maydis, however, the epidemiology and climatic conditions that favour disease development differs significantly. Diplodia ear rots are usually noted in seasons with early drought followed by excessive and extended rainfall during the maturation stage of the maize plant. Diplodia stalk rots become common in seasons where early season rainfall is followed by a midseason drought period during grainfill. This unexpected stress on the maize plants at this critical period predisposes the plants to increased withdrawal of sugars from the stems which increase their susceptibility to various stalk rot pathogens. Diplodia stalk rots may also occur when the roots and crown are infected by fungi such as Gibberella root and crown rot which prevents nutrient and water uptake by the plant during grainfill. This again stresses the plant, forcing it to withdraw sugars and nutrients from the stalk, which in turn predisposes the stalk to infection by stalk rot pathogens of which Diplodia stalk rot is one. Diplodia ear and stalk rot disease produce specific mycotoxins which have been shown to affect animals differently in various studies, many of which were originally determined in South Africa where field symptoms of diplodiosis were initially reported. S. maydis. Recent reports of diplodiosis in Argentina, Australia, Brazil and the USA have resulted in an increase in local and international research on the mycotoxins produced. Maize infected with S. maydis has been reported to be acutely toxic to ducklings and rats. Reports have indicated that Diplodia-infected maize used in the chicken broiler and egg laying industries has resulted in reduced performance in both industries. In subsequent studies no correlation was found between the toxicity of S. maydis isolates in ducklings and their ability to induce diplodiosis in cattle and sheep. Some of the S. maydis isolates were acutely toxic to ducklings and rats, but were unable to induce diplodiosis in either cattle or sheep. This may indicate that more than one mycotoxin may be produced by S. maydis isolates and that the isolates of the fungus may vary in their ability to produce certain mycotoxins. Their effect on humans has not yet been determined. Continued research on Diplodia ear rot, stalk rot and their mycotoxins will improve our understanding of this complex disease and its mycotoxicology. Diplodia ear rot symptoms associated with early infections during early ear development are yellowing and drying of husk leaves while the stalks and leaves remain green (Photo 3). Infection generally begins at the ear base and ramifies upwards. The entire ear becomes overgrown with a white mycelial growth. A cross section of an infected ear shows black spore producing bodies (pycnidia) at the kernel bases (Photo 4). Late season infections may occur when kernel moisture is low and symptoms are less obvious. Embryos become infected and slightly discoloured, but no ramification of the rest of the ear occurs. Such symptomless infections are locally referred to as skelm Diplodia. Yield losses caused by Diplodia ear rot have not yet been quantified, because the harvest method, make of harvester, harvest speed, harvester settings, etc all affect the percentage rotten kernels that remain in the grain bin or trailer. The rotten kernels that are light enough are blown out during the harvesting process, the percentage hereof depending on abovementioned factors. This implies that where diplodia ear rot infections are serious, damage is twofold. Firstly, if a low percentage of rotten kernels are discarded during the harvesting process, serious grain quality reductions occur. Secondly, where a high percentage of rotten kernels are discarded in the harvesting process, it will improve grain quality, but manifest itself as yield loss. Diplodia stalk rot reduces the ability of the maize plant to reach its full yield potential by preventing adequate grainfill, i.e. a reduced thousand kernel weight and by preventing the pollinated ear from filling all kernels on the ear. This results in incomplete ears without grain developing on the cob towards the tip. Diplodiosis, a nervous disorder of cattle and sheep, results from the ingestion of ears infected by S. maydis. Cases of diplodiosis occur from six days to two weeks after the animals are placed on fields with infected maize cobs. The disease is characterised by reluctance of the animals to move, a wide-based stance, incoordination, tremors, paralysis and death. Myelin degeneration (status spongiosis) is the major histopathological change observed in affected animals. The disease also causes abnormal foetal development and foetal death. Field outbreaks of diplodiosis in southern Africa are favoured by late, heavy rains and occur during the late winter months (July to September). The practice of using harvested maize fields for winter grazing is a major contributing factor to outbreaks of this mycotoxicosis. In addition to diplodiatoxin, new metabolites, namely dipmatol, diplonine and chaetoglobosins K and L, have recently been isolated from S. maydi-infected crops. To date, none of the pure metabolites has been administered to ruminants in order to reproduce the disease. Until such time that the toxic metabolite(s) responsible for this disease are fully understood, diplodiosis will continue to be reproduced experimentally only by feeding naturally infected maize or pure cultures of the fungus or their extracts to ruminants. As previously mentioned in this article, not all S. maydis isolates are toxic. For example, two isolates from the same field may be fed to ducklings with one being toxic and the other not. This makes decisions difficult on whether or not to use Diplodia-infected grain for feed for certain animals. Ruminants and poultry are found to be the animals most affected by Diplodia-infected material. Milling-infected grain is thought to reduce the heat-sensitive toxin and ensure that the total Diplodia-infected grain content of feed rations is lower than 10%. Animals, particularly cattle, being fed Diplodia-infected rations must be monitored. As soon as symptoms of reluctance to move, standing with wide-based stance, poor co ordination, walking stiff legged with a high stepping gait, falling, paralysis, constipation, salivation and tremors are observed, animals must be removed immediately and fed on healthy rations. Recovery rates are high, but animals will die if kept on the infected ration. The incidence and severity of Diplodia ear and stalk rots are largely seasonal which means climatic factors play a major role in the epidemiology of these two diseases. Epidemics of Diplodia ear rot have been associated with early season droughts and late season rains, particularly where infected stubble has been retained on the soil surface and susceptible hybrids have been planted. The epidemic of the mid 80s in South Africa has since been followed by smaller, more localised epidemics. These areas are generally where susceptible hybrids have been planted in monoculture where surface stubble retention was high following a previous yet often unnoticed Diplodia stalk rot epidemic. The reason that Diplodia stalk rot epidemics often go unnoticed is that breeding programs have focussed on resistance to lodging which does not equate to resistance to the stalk rot pathogens, but rather to rind (outer layer) strength. This means that plants may still be infected by the stalk rot pathogens, but not lodge as easily. S. maydis spores are transmitted by air, seed and soil. Airborne spores result in heavy infections up to 10 m from the inoculum source and the number of successful infections is reduced with distance. Single spores travelling long distances may lead to trace infections which may then develop into an epidemic focal point. Infected maize seed is an important inoculum source which may result in seedling and crown rot diseases. However, the majority of S. maydis-infected kernels do not germinate. Spores land behind leaf or ear sheaths where they germinate and infect stalks or ears. Stalk infections may occur through root and crown infections where viable spores in the ground infect under favourable conditions and the fungus ramifies up through the crown into the lower internodes when the maize plant becomes stressed. Spore germination is inhibited by exposure to sunlight and desiccation. Free water is necessary for germination and an infection may take up to seven days after spore germination to flame up. Germinated spores may enter tissue and lie dormant until conditions are favourable for fungal growth through the tissues. Mycelial colonisation is accompanied by cell wall degradation ahead of the growing pathogen. This is due to enzymes that are secreted. Fungal ramification of maize ears begins at the shank. Cob tissue colonisation begins at the attachment with embryonic tissues and proceeds into the endosperm. Similarly stalk ramification may also occur. These infected tissues develop fruiting bodies (pycnidia) which produce spores during the subsequent season. Control of Diplodia ear rot includes surface stubble reduction by means of grazing, burning, baling or ploughing in of surface maize stubble. As the fungus (Stenocarpella maydis) survives on maize stubble and survives poorly in soil, any management practice that reduces levels of infected surface stubble will reduce inoculum concentrations in the field. The removal of stubble for a single season and then resorting back to stubble retention practices, only reduces Diplodia ear rot for that specific season. Where stubble is present the following season, the risk of Diplodia ear rot will increase to its original level, should weather conditions be favourable. There is however, a slight contradiction when taking Diplodia stalk rot into consideration as conservation tillage practices improve soil water retention and in doing so reduce plant stress levels which reduces predisposition to Diplodia stalk rot. These are two separate diseases as the climatic conditions influencing the epidemics of the two diseases, but the same pathogen and host, are however involved. Stubble retention may on the one hand increase Diplodia ear rots should the pathogens’ inoculum survive on this stubble the previous season; it may however reduce possible stalk rot incidence which in turn may reduce inoculum levels for the following season. To reduce the possible effects of this contradiction, it is critical that Diplodia ear and stalk rot control is seen holistically and that other control measures are included in an integrated control programme to manage both Diplodia ear and stalk rots. Avoid planting unrealistically high plant populations on marginal soils and in areas where there is a high probability of drought, leaf or alternate stalk rot disease conditions. Ensure plant nutrition is adequate and balanced relative to the yield potential of the land or area to be planted. Unnecessary stressors on the crop may increase the potential for Diplodia stalk rot which indirectly in the long term may increase inoculum levels on the land and under conditions favourable for Diplodia ear rots an epidemic may occur. To date no direct relationship between plant stress and Diplodia ear rot has been reported. Crop rotations reduce Diplodia ear rots by reducing inoculum levels in two ways. Firstly, a non-host for the fungus will not allow the fungus to persist for the season where maize is not grown. Secondly, a greater period (a season or two) between maize crops allows for a natural breakdown of maize stubble, which again reduces the survival of the fungus. Leguminous crops, such as soybeans, dry beans, groundnuts, cowpeas, etc are very good rotation crops. Other rotation crops that reduce Diplodia ear rots, are wheat, oats etc. Sunflowers do not significantly reduce Diplodia ear rots under experimental conditions, but, the reason therefore has not yet been found. Early harvesting will reduce Diplodia ear rots as it reduces the time available for the fungus to grow on the ear. The fungus (Stenocarpella maydis) can grow on maize ears in the field until 11% moisture. Late or winter rains keep ears wet and increase the chance for fungal growth. In certain cases it would pay to harvest early at higher moisture levels and artificially dry grain. This is possibly why Diplodia ear rot is not a major problem in the USA where maize is harvested early and dried artificially. Selection of cultivars is very important in the control of Diplodia ear and stalk rots. However, it appears that there is widespread confusion regarding resistance and the use of resistance. Four concepts involved in reactions of hybrids to diseases are tolerance, resistance, susceptibility and immunity. These all refer to different reactions of a hybrid to a specific disease. Resistance does not imply that a hybrid will not get a specific disease. This is immunity. Resistance is a scale that runs from resistant to susceptible, with varying degrees of resistance/susceptibility in between. It is a misconception that resistance implies no disease at all (immunity). Resistance is relative to other hybrids. For example, where the mean of all hybrids tested is 30% diplodia ear rot, any hybrid with less than 30% is resistant and those above 30% are susceptible. This mean percentage varies from one season to another, depending on weather conditions and inoculum levels. During a season where the mean ear rot of all hybrids is 5%, the resistant hybrid should still be resistant and the susceptible still susceptible where hybrid reactions are consistent. Thus, resistance/susceptibility is relative to other hybrids. This effect is an interaction between the available inoculum, the host and prevailing weather conditions. Generally speaking, a resistant hybrid will always have less Diplodia ear rot than susceptible hybrids relative to prevailing conditions. However, there are many maize hybrids that react consistently over all localities, but there are some that do not. The local South African National Cultivar Trial entries are used to screen maize hybrids annually for resistance/susceptibility to Diplodia ear rots under various weather and inoculum conditions. Resistance to Diplodia stalk rot is difficult to quantify as plant standability or resistance to lodging, does not necessarily mean the stalk is not infected with Diplodia stalk rot. It means that even though the stalk may be infected with Diplodia stalk rot, it will not lodge. This counters Diplodia stalk rot by preventing lodging and is generally achieved by improving stalk rind thickness. A thicker rind may still have Diplodia stalk rot which results in the breakdown of the stalk pith tissue within the rind. Thicker rinds may in the long term have the unintended effect of actually increasing Stenocarpella maydis inoculum as it is more resistant to decomposition and may improve survival of the inoculum which from extensive studies has been shown to survive successfully in intact maize residues, particularly those retained on the soil surface. It is therefore important that Diplodia stalk rot resistance is seen in the correct context. There is no antidote for diplodiosis, but risks can be managed by removing the animals from harvested fields as soon as the first signs of diplodiosis appear. Most, if not all, of the affected animals should recover with good nursing after removal from the infested fields. All mouldy maize cobs should be removed from the field and destroyed before the animals are allowed back into the harvested fields. Integrated control practices discussed above to reduce Diplodia ear and stalk rot epidemics which include the use of resistant crop varieties and crop rotation, aimed at reducing the levels of S. maydis infection of the maize plants, should be considered as preventive measures for the outbreak of diplodiosis. Should any producers observe suspicious symptoms in ruminants grazing on maize fields and suspect diplodiosis, please contact the author at 018 299 6362 or at FlettB@arc.agric.za; or Dr Mxolisi Masango at MasangoM@arc.agric.za from the Toxicology and Ethnoveterinary Medicine, Food, Feed and Veterinary Public Health (FFVPH) Programme, Agricultural Research Council-Onderstepoort Veterinary Institute (ARC-OVI), South Africa. As we receive confirmed reports, it will be added to a database to trace confirmed cases of diplodiosis in South Africa.